Aibileen may have been just the lowly black servant of the house, but she forever positively influenced the lives of the children’s ears she whispered those words into. I watched “The Help” and then read the book recently. A wonderful story with touching characters and harsh realities of our world. Aibileen was treated as unimportant, but she made sure the children in her care felt elevated. Aibileens kindness and intelligence went unnoticed because of her skin color, but she was one of the most perceptive and giving characters in the story. She saw the prejudice around her and the prejudice directed at her, but she rose above it and lived in truth. Prejudice still exists today. Sometimes it not the color of the skin, but the address of their home or the intelligence of their being. Hate comes masked in all different forms. Evil comes masked behind pretentious smiles just as often as hatred is visually noticeable in others body language. We need love, we need acceptance, we need purpose. We need to be told we are kind, smart and important. People do not realize we feel that way unless we tell them. Can you imagine if every child was told each day how important they are to the world around them…what a world this would be…just stop and imagine…now help that become a reality! Those three little sentences in a movie about so many life lessons may have been the most profound for me. Mark was walking home from school one day when he noticed the boy ahead of him had tripped and dropped all of the books he was carrying, along with two sweaters, a baseball bat, a glove and a small tape recorder. Mark knelt down and helped the boy pick up the scattered articles. Since they were going the same way, he helped to carry part of the burden. As they walked Mark discovered the boy’s name was Bill, that he loved video games, baseball and history, and that he was having lots of trouble with his other subjects and that he had just broken up with his girlfriend. They arrived at Bill’s home first and Mark was invited in for a Coke and to watch some television. The afternoon passed pleasantly with a few laughs and some shared small talk, then Mark went home. They continued to see each other around school, had lunch together once or twice, then both graduated from junior high school. They ended up in the same high school where they had brief contacts over the years. Finally the long awaited senior year came and three weeks before graduation, Bill asked Mark if they could talk. You may have read or heard of a similar story on the internet about Kyle, but that story exploded from this simple one. But this story is not simple, it was important to Bill. It is a story that needs to be shared. You can be a Mark to someone else and turn a simple momentary act into life altering action! You can be Aibileen and build up someone’s confidence by using only the power of your words! 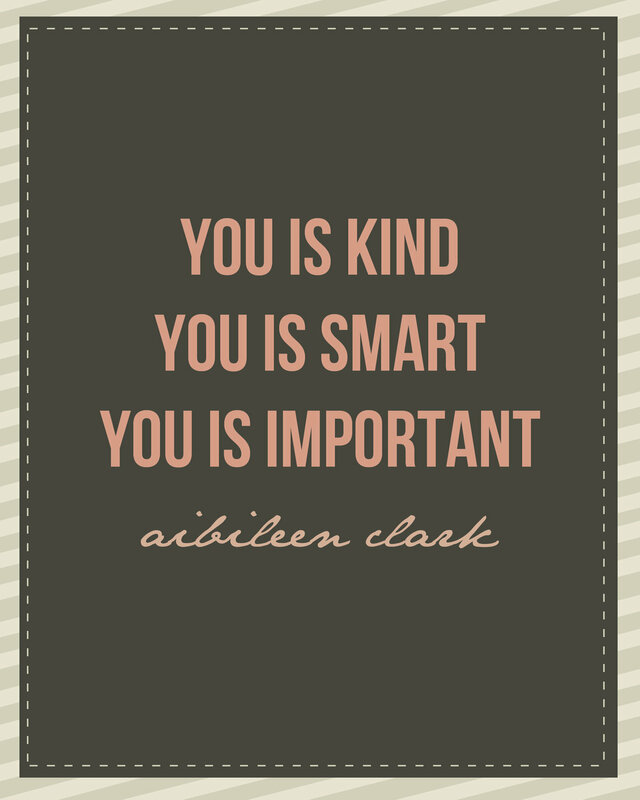 How will you be Kind, Smart and Important to someone else today?